Reprinted from Learn NC This work is licensed under a Creative Commons Attribution-NonCommercial-ShareAlike 2.5 Generic License. By the middle of the 1800s, the U.S. Census Bureau was asking more information about the people of each state and their economic production. Beginning in 1840, census takers asked people their occupations. The lists below show the occupations that free North Carolinians reported in the Census of 1860. "Dairymen, nurserymen, and overseers have been placed in the farmer group; farm hands, day laborers, laundresses, servants, teamsters, apprentices, drivers, and those similarly employed have been placed in the laborer group; those who followed a craft, such as cooper, blacksmith, carpenter, have been classified as tradesmen; physicians, teachers, lawyers, engineers, public officials, and the like have been classified as professional workers; grocers, druggists, innkeepers, traders, bankers, and the like have been placed in the merchant group; clerks, bookkeepers, collectors, and those of similar employment have been classified as white-collar workers; and coachmakers, cabinet makers, harnessmakers, distillers, tobacco manufacturers, and establishments of a similar nature which seem to have been operated on more than an ordinary outlay of capital have been classified as manufacturers." Johnson, Guion Griffis. Ante-Bellum North Carolina: A Social History, Electronic Edition, 57. Chapel Hill, N.C.: University of North Carolina Press. 1937. http://docsouth.unc.edu/nc/johnson/ (retrieved on May 15, 2008). United States Census Office. 8th census, 1860. North Carolina, 1860 federal census: population schedules. Washington [District of Columbia]: National Archives & Records Administration. Documents on Internet Archive: http://archive.org/search.php?query=collection%3A1860_census%20AND%20subject%3A%28North%20Carolina%29 (accessed December 8, 2014). 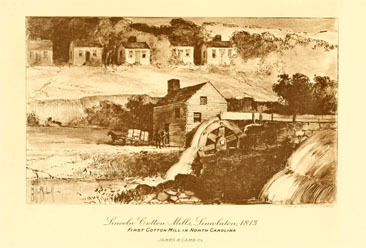 "Lincoln Cotton Mills, Lincolnton, 1813." Illustration. E. E. Everton Foster, ed. Lamb's Textile Industries of the United States. Boston: James H. Lamb. 1916. https://archive.org/stream/lambstextileindu02brow#page/n526/mode/1up (accessed February 5, 2015).